During the summer of 1663, indentured servants (held for several years of service) in the Poropotank River and Purtan Bay region plotted an insurrection against their masters to occur on 13 Sept. 1663. It was prevented when John Berkenhead, servant of Maj. John Smith, of Gloucester County, informed the authorities of the planned uprising. 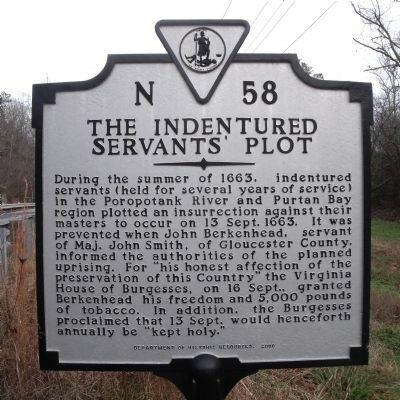 For "his honest affection of the preservation of this Country" the Virginia House of Burgesses, on 16 Sept., granted Berkenhead his freedom and 5,000 pounds of tobacco. In addition, the Burgesses proclaimed that 13 Sept. would henceforth annually be "kept holy." Location. 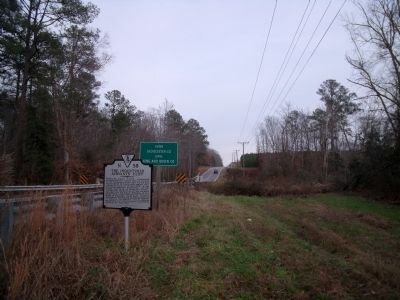 37° 30.002′ N, 76° 39.142′ W. Marker is near Saluda, Virginia, in King and Queen County. Marker is on Buena Vista Road (Virginia Route 14) half a mile east of Poropotank Drive, on the right when traveling east. Touch for map. Marker is in this post office area: Saluda VA 23149, United States of America. Touch for directions. to this marker); Poropotank Creek (a few steps from this marker); Gloucester Hall (approx. 2 miles away); Poplar Spring Church (approx. 3.6 miles away); a different marker also named King and Queen County / Gloucester County (approx. 4.1 miles away); Marlfield (approx. 4½ miles away); Middlesex County / Gloucester County (approx. 6.4 miles away); Bethel Baptist Church (approx. 6.7 miles away). Touch for a list and map of all markers in Saluda. More. Search the internet for The Indentured Servants' Plot. Credits. This page was last revised on January 23, 2019. This page originally submitted on December 8, 2009, by Bernard Fisher of Mechanicsville, Virginia. This page has been viewed 3,781 times since then and 124 times this year. Last updated on January 23, 2019, by Zachary john gray of Ruston, Louisiana. Photos: 1, 2. submitted on December 8, 2009, by Bernard Fisher of Mechanicsville, Virginia.